As most of you know, I took a little break for my 24th birthday. A normal week seems to pass by pretty quickly, but a fun week with my fiancée seemed to go by even faster. But at the same time, the days felt full and long. It's hard to explain, but I don't think that any time spent with Caroline would seem long enough. That's just how it is. 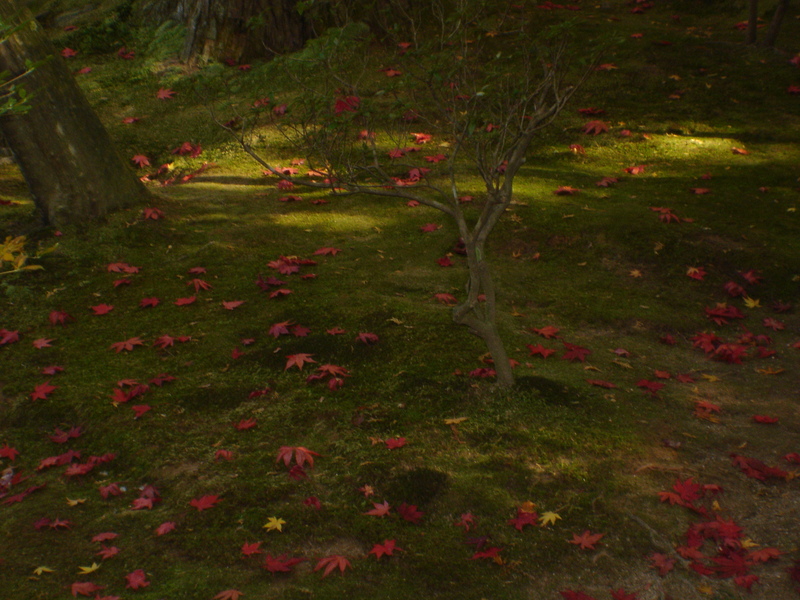 As for my trip to Kyoto, take a look a little further down the column, and you'll hear all about it. In gaming news, Caroline brought me Mario Kart DS, and I must say that it is one of the most excellent games that I have ever played. The game will make you angry by having an in-the-bag victory spoiled by a spiny shell, but then two races later, you find yourself giggling as the kart in front of you receives the same treatment. I'll be honest with you. The game WILL frustrate you, but it's the kind of frustration that makes you come back determined to show the game what you're made of. It's even better when played online or via LAN play with another DS. The game IS capable of sending itself to another DS for multiplayer fun without the need for a second cartridge, but everything is better with more copies of the game. But where the game REALLY shines is the online play. It's AWESOME. Want to play me? My friend code is 425261-694272. Just hop on RPGamer IRC chat and double click on me. Send me a message, and if I see it, I'll take on any and all challengers. Bring it on! But that's not the only game I got for my birthday. Like many of you, I've been playing Dragon Quest VIII: Journey of the Cursed King. I just started playing it today, but I had to pull myself away from the game to write Japandemonium. Even now, my hands want to grab for the controller to do just one more event. The game really IS that good. It will steal your soul, and from all accounts, it may be 100 hours before you get your soul back. But seriously, when was the last time your soul did anything for YOU recently? You can spare it for a few amazingly fun days. But I'm going to give fair warning. The game IS hard, and it will take hours just to buy the next weapon. I got destroyed by a regular party of monsters on an unlucky turn, and bosses aren't exactly easy either. Expect to get nervous, but know that you'll love every minute of it. I could go on and on about the wonders of those two games, but I'll let you all discover them on your own if you haven't already. 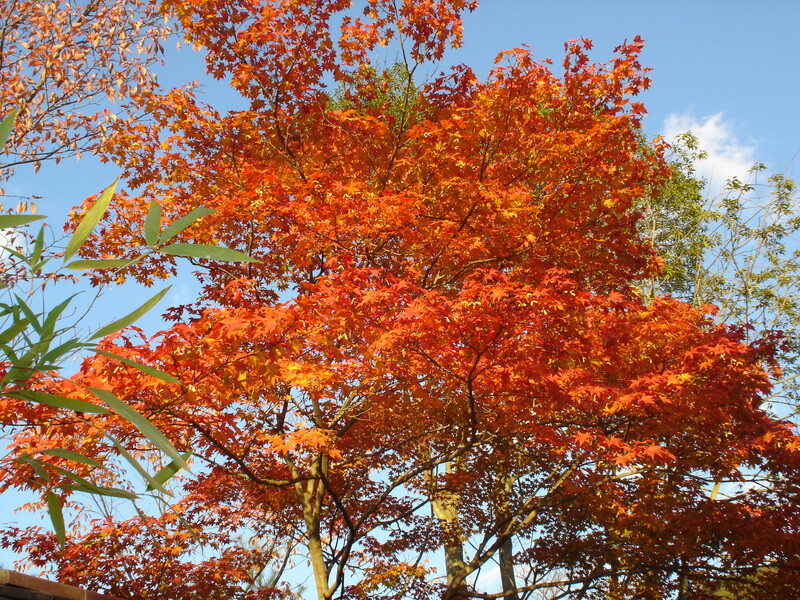 This week's title is the Japanese word for when the leaves change. There isn't exactly a single word for it in English, so it's not exactly possible to translate it. The best I can do is to show it to you, and I'll do exactly that as soon as you scroll past the Dengeki chart. That said, let's get this autumnal party started. It seems that there was not a chart for this week. I'm not exactly sure why, so I'll take this as a chance to give my own commentary. Like Bryan, I was kind of happy to see the DS Pokémon doing so well. I like the DS, and I'd like to see it become a nice, stable platform for Nintendo. Some of my favorite games have been on it. I was also pretty happy to see the new Gundam SEED game. I saw it in Osaka, and I was impressed. I normally pass on Gundam games, but this game looks HOT. I shall pick it up on my way out. Aside from that, I don't have much to add. So let's see these repeat numbers! For those of you that read my Live Journal, you already know the full story, but I'll give the Reader's Digest condensed version of things. I spent three days in Kyoto and Nara essentially retracing my steps from Golden Week, but this time it was far more beautiful. 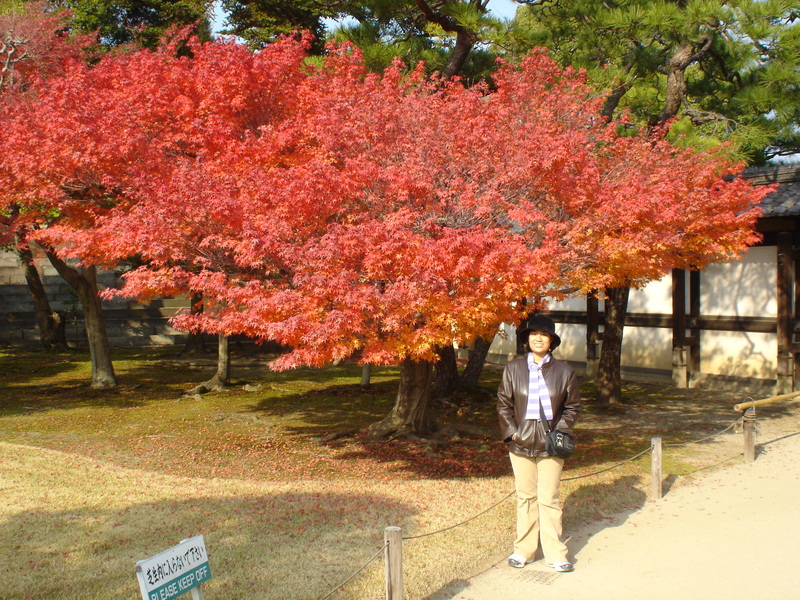 Kyoto is chock full of momiji (Japanese maple trees) and ginkgo trees that change brilliant shades of yellow, orange, and red in late November. 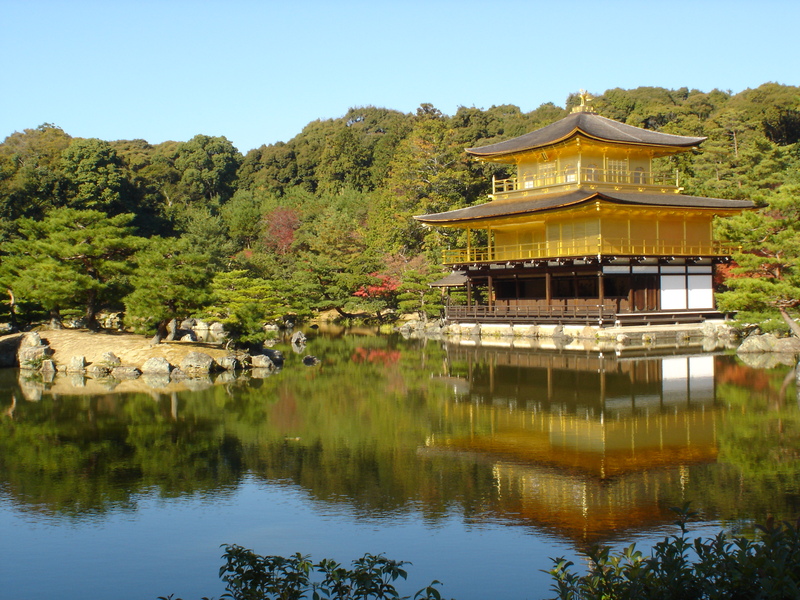 This time around, I've got a gorgeous shot of Kinkaku-ji with a perfect reflection in the water, a nice contrasting shot of Ginkaku-ji, a temple that was originally planned to have a silver coating but was never finished, and a picture of a tiny momiji that has lost its leaves. 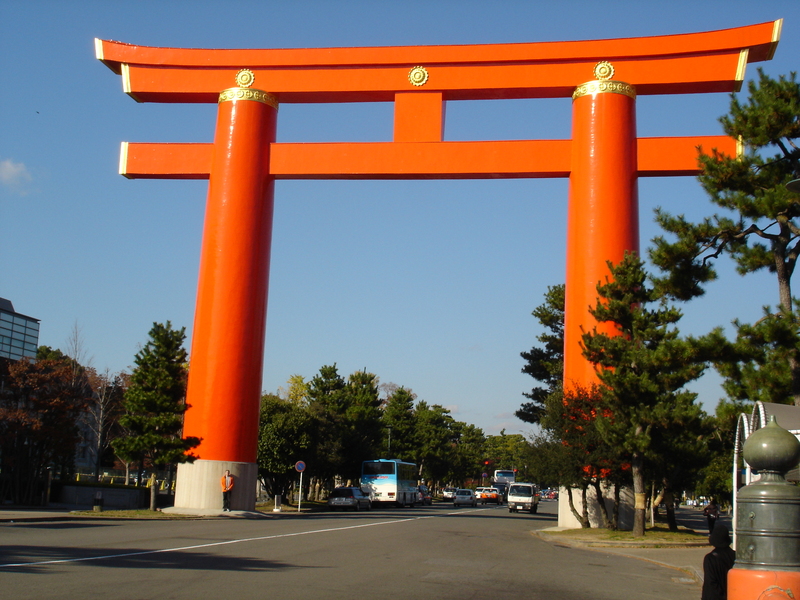 That wrapped up our morning temples, and then we headed to Heian-jingu, and that little speck at the bottom of that torii gate is me. 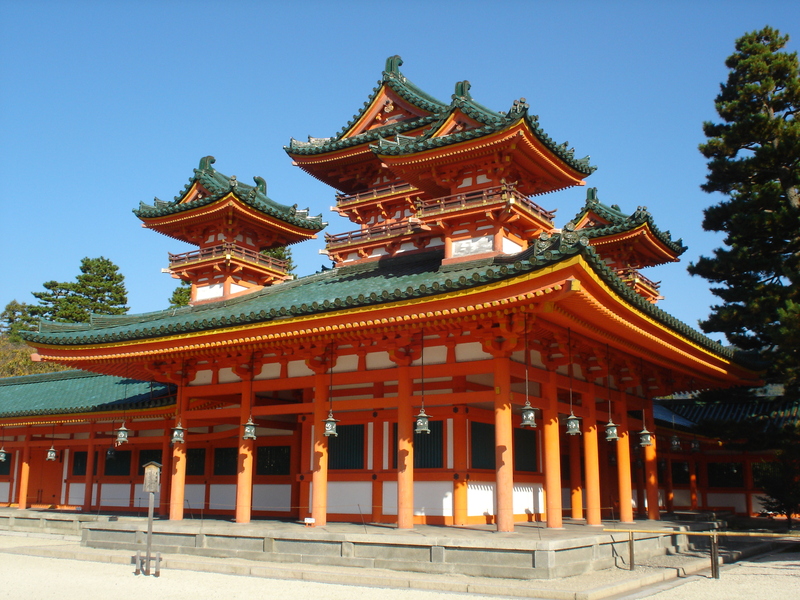 That's followed by a picture of one of the side buildings of the main temple. 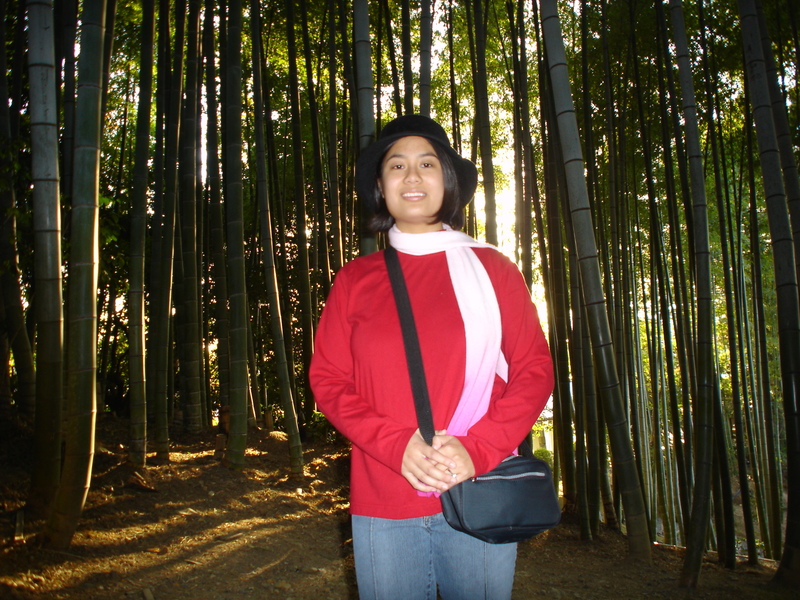 Then we went up to Gion to see Kodai-ji, and that's Caroline in the bamboo forest. 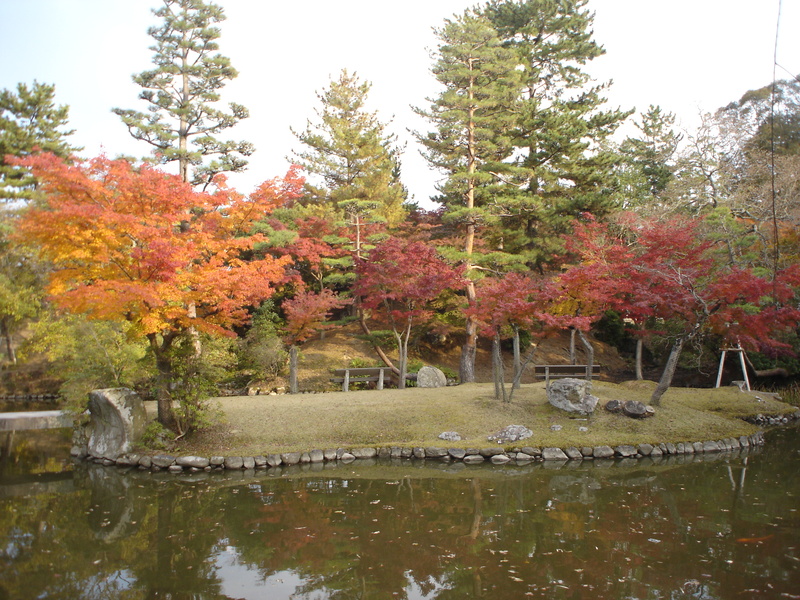 Then we have a brilliant momiji that we found on the way to the giant stone Buddha, and it seems you can go inside to see 12 more Buddhas for each of the animals of the zodiac. 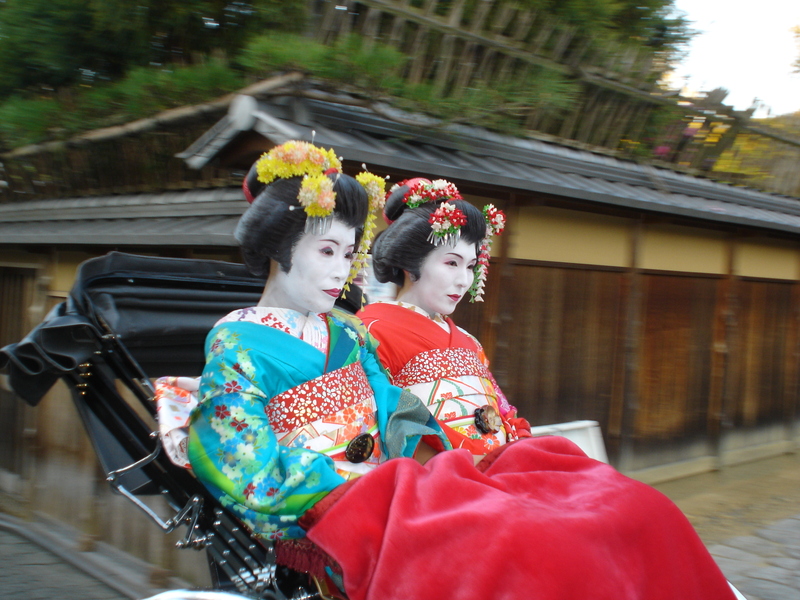 We then headed up to Kiyomizu-dera, but I got a snapshot of some maiko in a carriage before I got there. 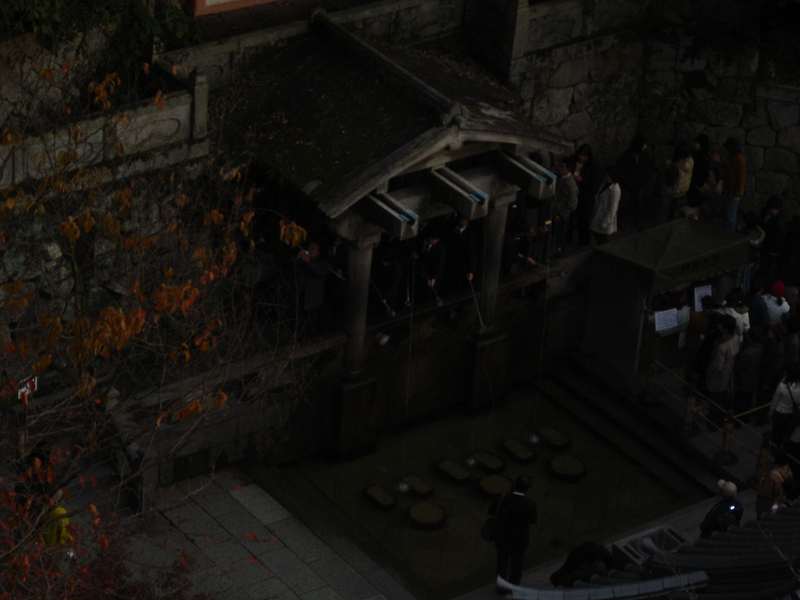 When we arrived at the temple, I got a nice shot of the fountain for which this temple is famous. Drinking from the three streams is supposed to grant wishes, or bring love, longevity, or good looks depending on the story you go by. 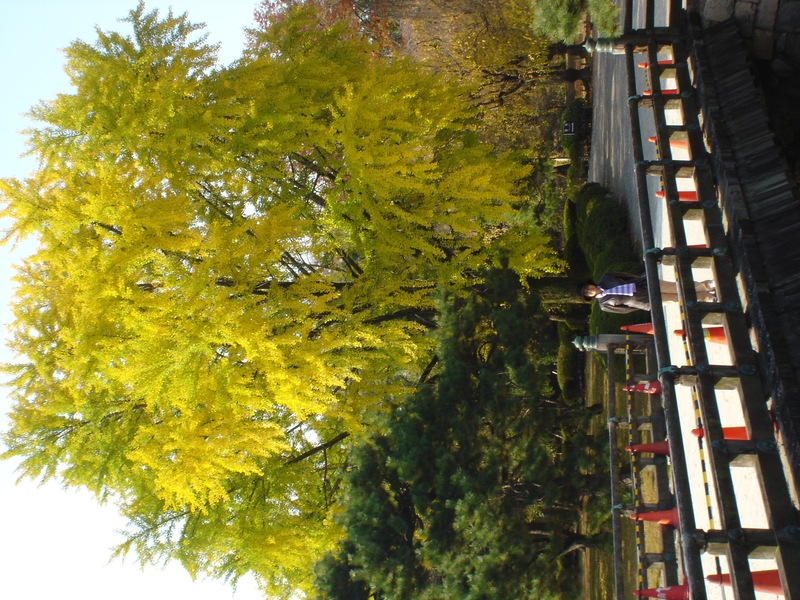 The next day was kicked off by going to Nijo Castle, and we got another nice picture next to a tree, but the real prize was a HUGE ginkgo next to a bridge. I wonder how old that tree actually is. 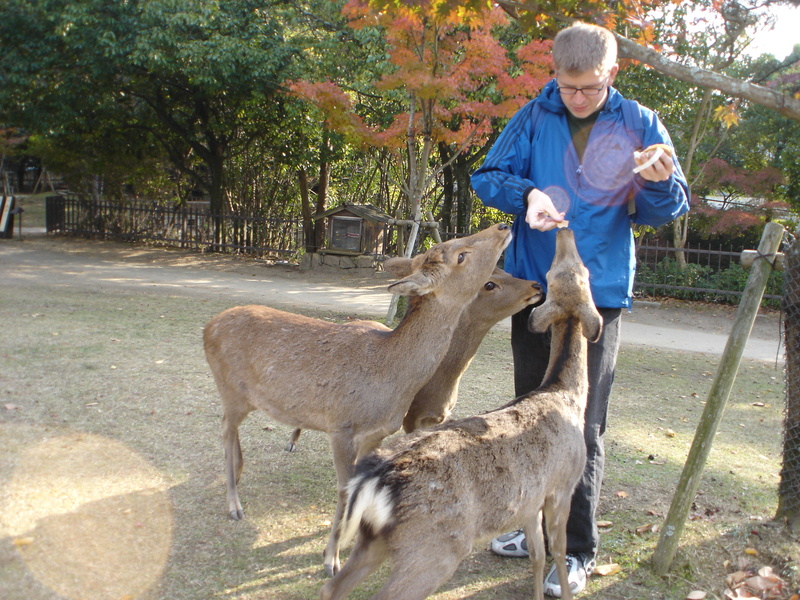 After Nijo, we hopped on a train to Nara to go feed some deer on the way to Todai-ji. 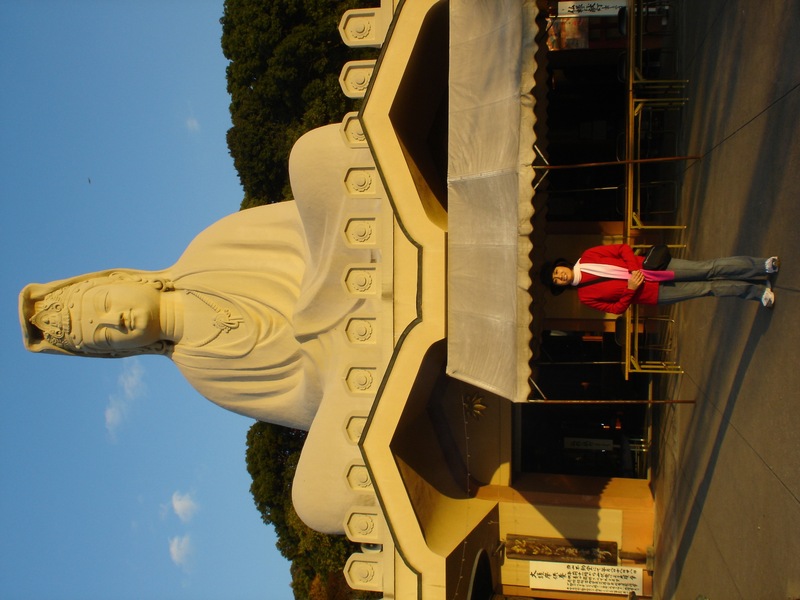 That temple is famous for its bronze statue of the Buddha that measures 16 meters in height. 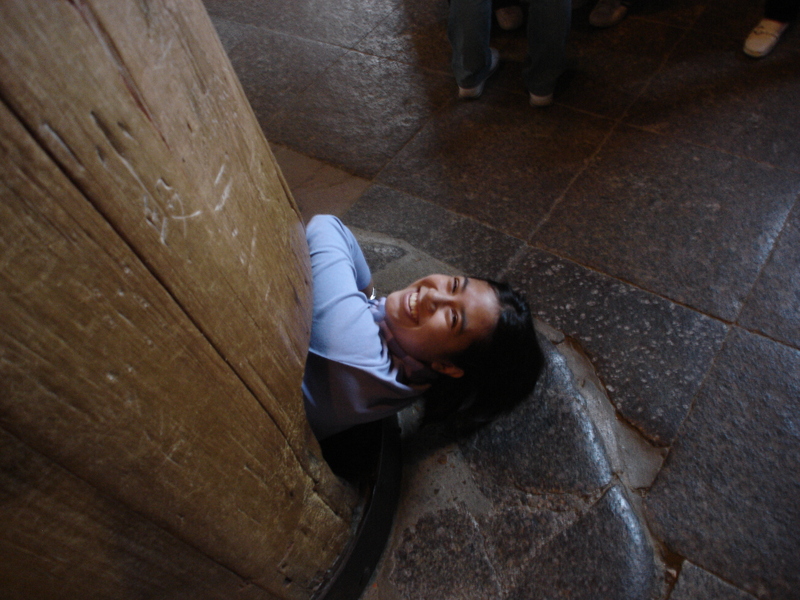 There is also a hole in the back of one of the pillars that is said to be the size of one of the Buddha's nostrils. If you can fit through it, you can attain enlightenment. I have photographic proof of Caroline's promise to become enlightened and a video of myself. 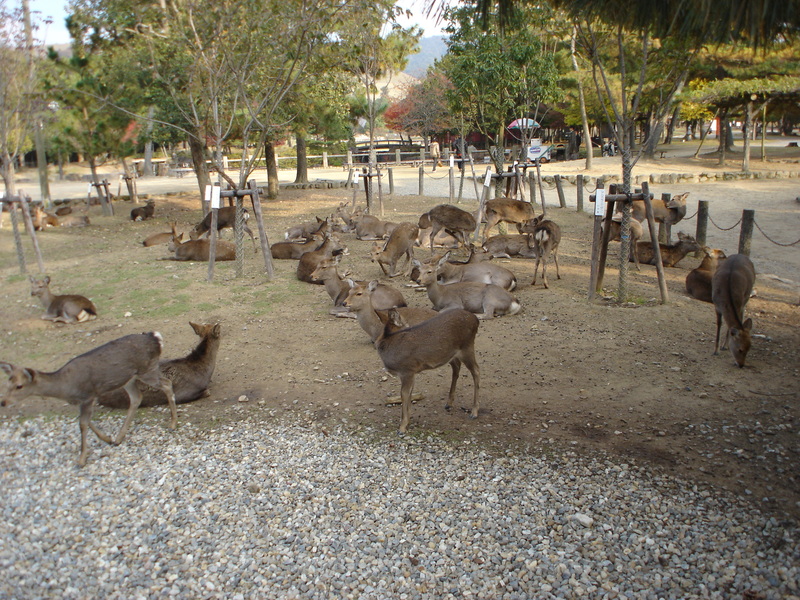 Then we started walking through Nara park again to get to Kasuga-taisha. There are entire herds of deer in that park, and some of the ponds reflected the leaves so well. 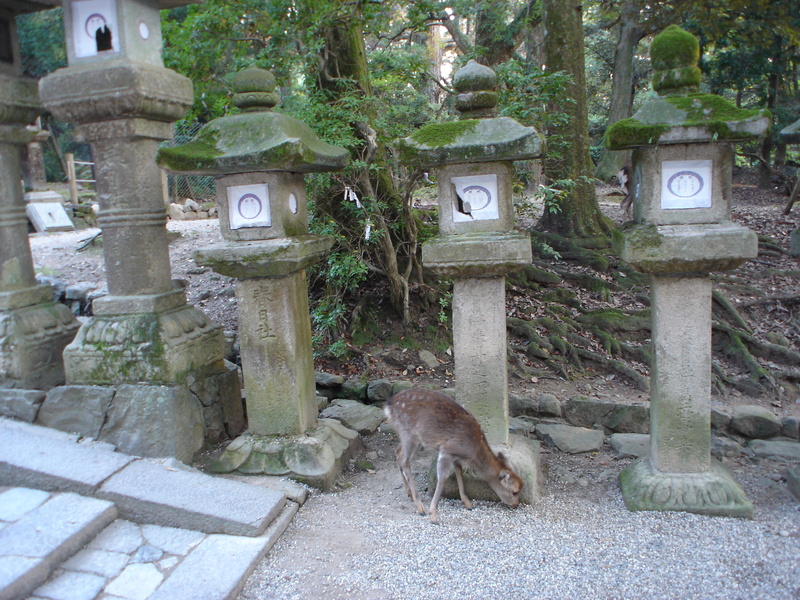 We got pictures of both before finally making it to the shrine, famous for its thousands of stone lanterns leading up to the main shrine building. 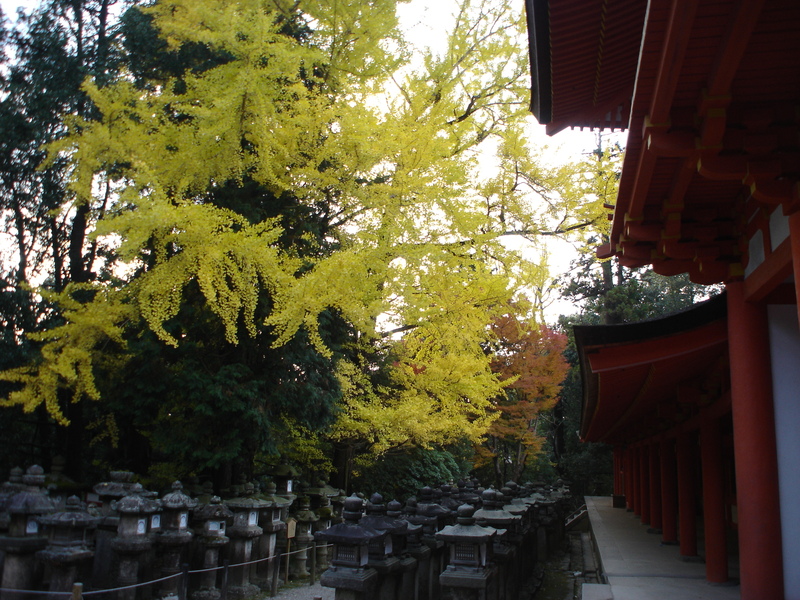 There was another ginkgo that set a nice contrast with the vermillion of the temple, and on the way down, we found the tiniest baby deer peeking through the lanterns. 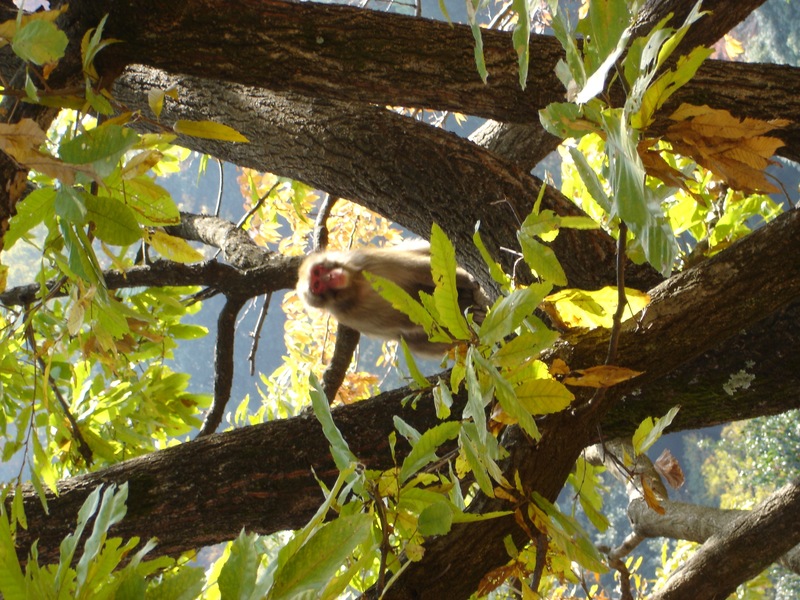 On our final day, we went to Arashiyama to go to Monkey Park. 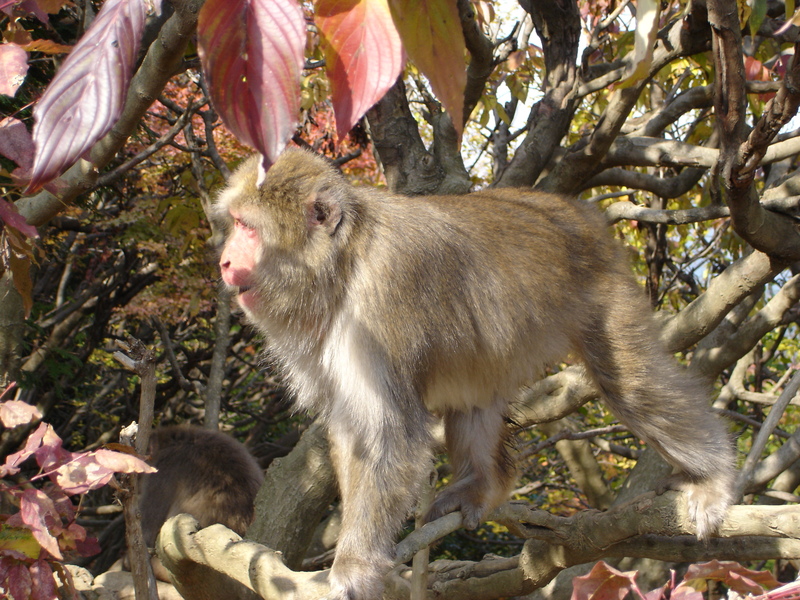 There are 163 monkeys there, and I got some great pictures of a few of them. 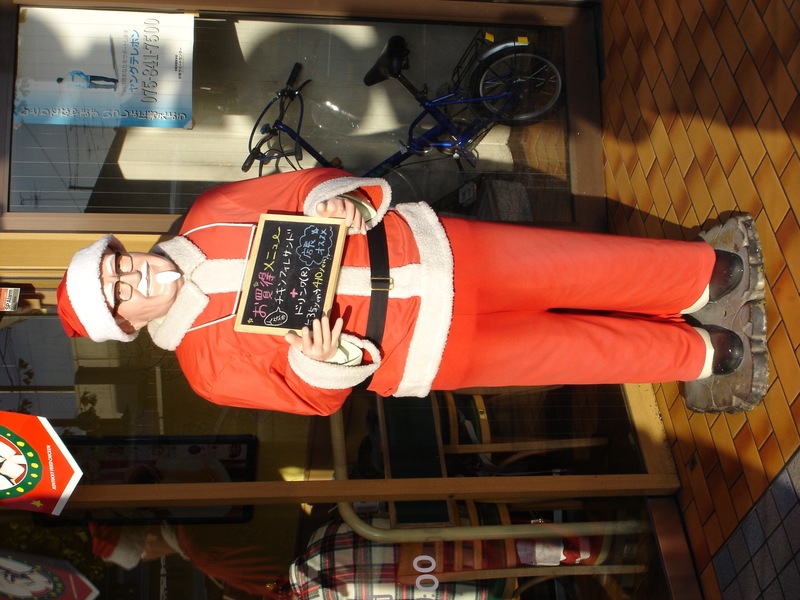 I'm posting the best two, and I'm going to end it on a picture of Colonel Sanders dressed as Santa. Some of you might remember an email asking about Mr. Chicken, well, here he is in all his glory. It was a bit of a hard three days, but if you have the endurance, you can take buses, subways, and walk all over Kyoto and find amazing things at every turn. 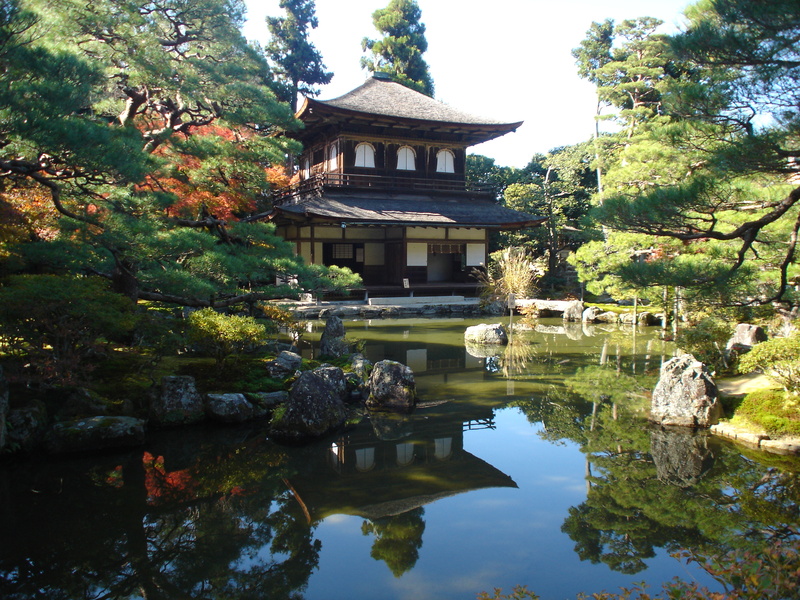 If you only hit one Japanese city, I have to recommend Kyoto over Tokyo. It's my favorite. Aruze is re-releasing Shadow Hearts III, and now it will also include Shadow Hearts II: Director's Cut. This new package deal will be called the Shadow Hearts III Starter Pack, and it will retail for the bargain price of 6090 yen on January 19 of next year. Sega announced that both the PS2 and PC versions of Phantasy Star Universe will hit Japanese shelves on February 16 next year for 7140 yen. Those that pre-order will also pick up a "Visual Book" containing character sketches and storyboards of the game's settings along with a "Mini-Soundtrack." Rune Factory has opened a new teaser site with the promise to fully open it sometime in December. In the meantime, take a look at these new propaganda scans which we shall translate for the next update. With my trip to Kyoto behind me, I returned to find a single email in my inbox, and now another email has beaten the buzzer to make it in time. I hope you all enjoyed last week's column, and I think Bryan did a fair job of everything. Since I don't have anything lined up for the next month, I should be pretty stable until Christmas for writing columns. As for a Japanese lesson, I'll be honest. Dragon Quest VIII has been dominating my thoughts. I logged in over ten hours in the first day, and I keep coming back for more and more. I haven't had a game take such control of me in a LONG time. Bear with me, and I'll whip something up for next week. That said, let's get to those two letters! Right now you should be having an adventure in Kyoto. Can't wait to see the photos you take, and hear what you did. The last time you took a vacation like this you came back with some splendid pics, and best part you have company, which was different from how my trip was. Got a few questions for you this time round. One is when are you done with your teaching, and did you plan to do any type of extension? Another thing is with respect to pictures, you've described your room and students a little, but do you have any pictures of your place or students. I recall last year you had a small christmas tree for your room. Finally, and more importantly to me is, I've a close friend who's planning on joining the JET program. I read through their entire site, and was looking for more. Could you provide a little insight on two things. 1. What's the interview process like (that's sometime in feb-march), is there any type of special prep you personally did for it? Turned out to be a long e-mail, so take your time and wish you a wonderful vacation. Yeah, I really had a great time again. I went with my family last time, and now I've taken Caroline to all those places. It was quite wonderful. I'm glad that I get to share those memories with her, because I feel that memories are better when people share them. Having company certainly makes it a lot more fun. As for my teaching, I've already extended it once. GEOS asks that you give them four month's advance notice if you are leaving. This is to ensure that they can find a replacement; the process is quite long. This also means that if you are one of the few that wish to stay, you also must do so at the eight month mark. After your first year, you can stay as long as you like, and you are no longer limited to full years. My contract was extended a full year, but I will be ending it in February, six months before the end. There is no problem with that assuming I give them four month's notice. As for pictures of apartments and students, I'm not so sure I can give you pictures of students. There is a new privacy protection law in Japan, so I can't post pictures of students without their permission. They also tend to be camera shy anyway. Now my apartment, that's a wholly different story. Originally, I was planning on doing an apartment special report in August. I took pictures of an apartment in Kobe, and I was going to run them along side pictures of my apartment. But the memory stick with the pictures got wiped, and the computer with the only copies is now dead and under my chair. I know I've been promising pictures forever, but this time I mean it. My apartment was always too messy to photograph, but Caroline just visited. That means my apartment was clean, so I can promise you that the pictures WILL be online soon. I've got 'em, I'm just waiting for the right time. As for the interview process for JET, I know little about it. There was a mistake on my application that I did not see. It seems that many universities list your date of graduation a full year later than you actually graduate so that student loans don't come due as soon as you step foot out of your school. My transcript showed me graduating in 2005, but I had my diploma in my hands at the end of May 2004. So when everyone in my Japanese class got interview letters, my mailbox was empty. I found out later that a routing problem delayed my rejection letter by a month. I was not exactly a happy sensei. As for preparation, I recommend you just go in there and try to sell yourself as best you can. Be honest, and answer their questions as fully as possible. Teaching in Japan is not a game, and if you commit to it, you need to be able to handle it. Trying to prepare for the interview probably wouldn't help much anyway. They just want to see you in person and make sure you'll be a good match for the program. Just relax and do your best. I've been living in Tokyo for awhile now and I consider myself pretty fluent in Japanese, though my kanji knowledge is relatively limited. Thus, I was wondering at around what kanji skill level I would need to be to be able to read the dialogue in an RPG such as Final Fantasy 8. I can get through most text based adventures with relative ease (though they all have spoken dialogue anyways), but I still thought I should ask. This is a REALLY hard question to answer. For one, I've not played Final Fantasy VIII in Japanese. Then there's the fact that my kanji is ALSO weak. The only answer I can give you is that your kanji needs to be pretty strong. Our translator is ni-kyuu in Japanese, meaning she passed the second-hardest test. She has no troubles, so maybe you need to be around there. Keep working on the kanji. It's the hardest part of Japanese, and I feel your pain. Thanks for the letter, even if I can't help so well. And thus, another column comes to an end. This one was kind of short, but I was also limited by our mail server being down. I think this might have also killed any letters for the Culture Corner that were sent, so if you didn't see you letter in the column, please resend. I answer any and all mail.